For the holiday season only, the Bobby Hotel's rooftop bar invites guests to enjoy its curling lanes. Have you ever dreamed of becoming an Olympic curler, even though you've never curled or understood anything about the sport? Now is your big chance. 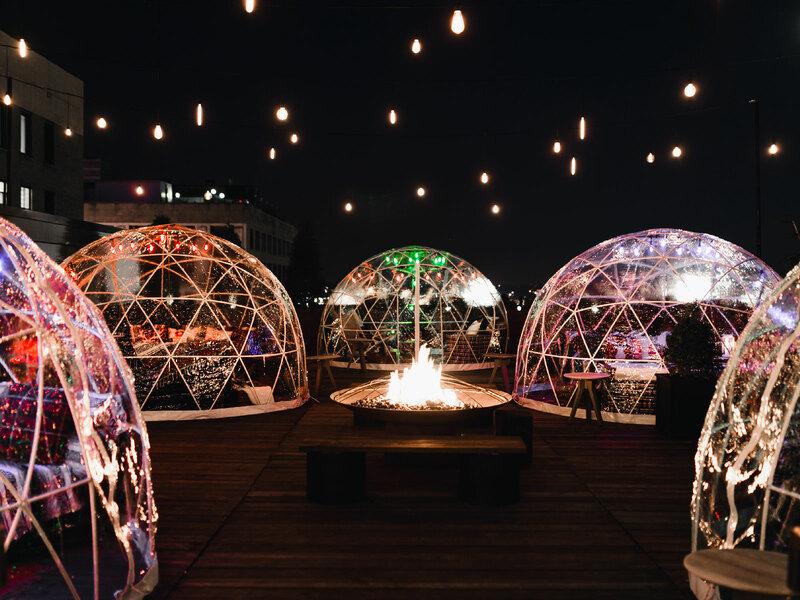 For the holiday season only, the rooftop lounge at Nashville's The Bobby Hotel has installed cozy heated igloos and, more importantly, two curling lanes, so you can finally begin your training! The Bobby Hotel's rooftop bar is transforming for the holiday season, serving a revamped holiday menu that includes mulled wine, spiked hot chocolate and apple cider, and seasonal toddies. The roof, which offers one of Nashville's best views and hops with trendy pool-goers in the summer, has been decked out with fire pits, blankets, and "communal wood plank seating," but why sit when you could curl? To our very limited knowledge, it is the only public curling venue in the city. While we aren't aware of any other bars that have added complimentary, limited-edition curling lanes this year, the heated igloo craze has taken the country by storm. (For example, you can find them this season in Atlanta, Cincinnati, Washington, D.C., Boston, New York, and pretty much everywhere.) Every year, the Chicago beer garden Kaiser Tiger installs curling lanes outside, though there is a $40 fee for rink rental. The bar also features a retrofitted 1956 Scenicruiser year-round, making it an exceptionally Instagram-friendly spot to convene, drink, and curl. Reservations aren't required, and the rooftop bar—and two curling lanes—are open to hotel guests and non-guests alike. It's open Sunday though Thursday from 4 to 10 p.m., and Friday and Saturday from 4 p.m. to 11 p.m.